The beast of Poland, Dariusz Swiercz is a chess prodigy who has broken many records so far in a young career. One of the top 5 players from Poland, Swiercz became a Grandmaster at the age of 14 years and 7 months. This made him one of the youngest Grandmasters in history and he has continually improved his play ever since earning the title. He hasn’t slowed down! Dariusz Swiercz learned to play chess at the age of three from his grandfather. He quickly showed that he had massive talent for the game of chess by crushing youth tournaments around Europe and specifically Poland. He was the Polish U-10 champion in 2002, European U-9 champion in 2003, Polish U-12 champion in 2005 and 2006, Polish U-14 champion in 2007 and World U-18 champion in 2012. In between these championships, he became a FIDE Master in 2004 and an International Master in 2008. He followed this up with becoming a Grandmaster in 2009 and has continued to improve. In 2010 he won the Cultural Village Tournament and was invited to the Tata Steel Group C tournament in 2011 where he tied for fourth place. 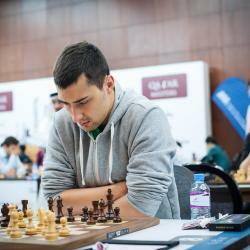 Also in 2011, he won World Junior Championship, tied for fourth in the Polish Championship and tied for first at the Miguel Najdorf International Chess Festival. In 2012 he won more tournaments and qualified to play in the World Cup in 2013 where he was eliminated in the second round by Alexander Grischuk. It was in this year that he also got a high enough rating to enter the top 100 list for the first time (peaking at number 99). He continues to be a top junior player, one of the best players in all of Poland, and an elite player in the world.